Rookie cards in baseball cement a snapshot of hope, potential, and excitement in a player's career. Fans can clearly remember the hype surrounding a player's debut and where and how they acquired that special card. Looking back at the fresh faces drums up memories of a more innocent time when they all had the opportunity to become impact players for their respective teams. Players also have sharp memories of their first look at their initial and sometimes only appearance on a major league card. Having their own card signals they have made it, their official status immortalized on cardboard as a professional ballplayer. Giving a player their rookie card to sign often presents an interesting exchange about their recollections of when they were first asked to sign it. Mike Bielecki, a veteran of 14 major league seasons, was named Baseball America's Minor League Player of the Year in 1984 after going 19-3 for the Hawaii Islanders of the Pacific Coast League. 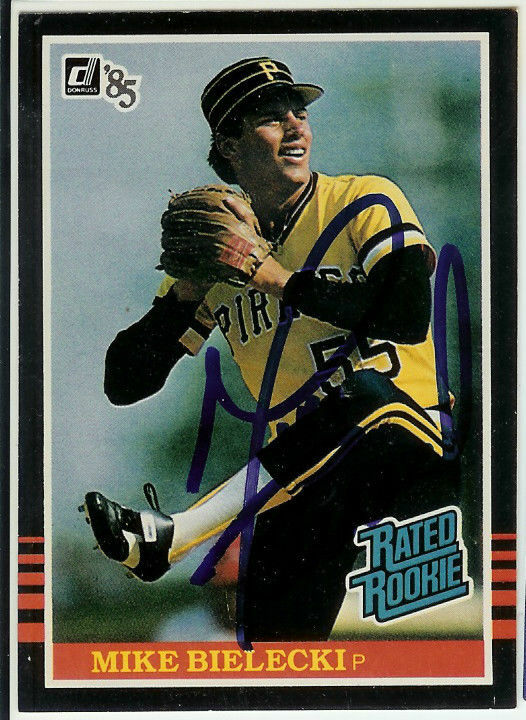 He was a September call-up at the end of the season, pitching 4.1 scoreless innings of relief, long enough to earn him a spot as a “Rated Rookie” in Donruss' 1985 set. When handed his 1985 Donruss issue at a charity event last week, Bielecki starkly recalled not knowing the card was out when he was first asked to sign it.